In the Transmutation Series, I emulate the proto-science of Alchemy, which united the quest to transform “base” metals into “noble” metals with the goals of curing all illness and prolonging life through the formulation of a universal elixir. 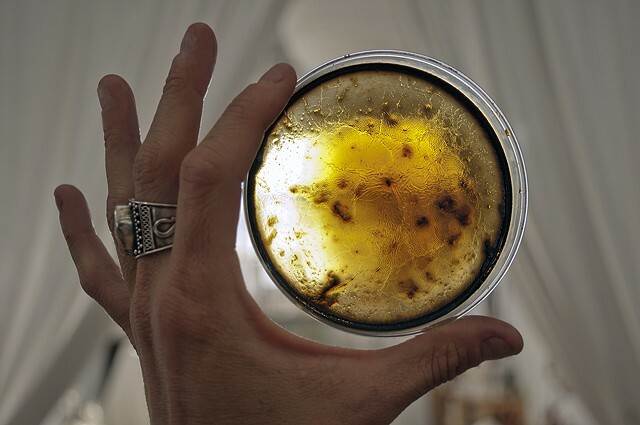 To create the images in this body of work, I first combined my iron-rich blood and the two types of synthetic insulin I take with various forms of sugar and light sensitive chemistry in Petri dishes. I then exposed the mixtures to sunlight for several days, sometime weeks, to make crystalline formations. Afterwards, I placed the Petri dishes in an enlarger, which like a microscope, magnified the complexity of the delicate structures, and allowed me to translate them into silver gelatin photographs in lieu of using a camera. I subsequently toned the prints in a gold chloride solution. Through my experimentation, I transformed iron into silver, and silver into gold. I also discovered connections between the chemical reactions in photography and the human body’s ability to metabolize sugar, an essential, life-sustaining process I myself cannot perform naturally due to the chronic autoimmune disease Type I diabetes. Through these photographs, I examine the replication and mutation of natural structures at microscopic and macroscopic levels and the continuum of energy that animates the cosmos from the cellular to the planetary, while reflecting upon the singularity and ephemerality of human life within the vast expanse of the universe. My hope is that these multivalent metaphors will unite my monadic experience with the eternal cycles of emergence and decay that connect everything on an elemental level.